In 4-quart saucepan or Dutch oven, cook noodles as directed on package. Drain; return to Dutch oven. Meanwhile, heat oven to 350°F. Spray 8-inch square (2-quart) glass baking dish with cooking spray. Cut small slit in top of each pouch of vegetables; place both on microwavable plate. Microwave on High 4 to 5 minutes or until broccoli is crisp-tender. 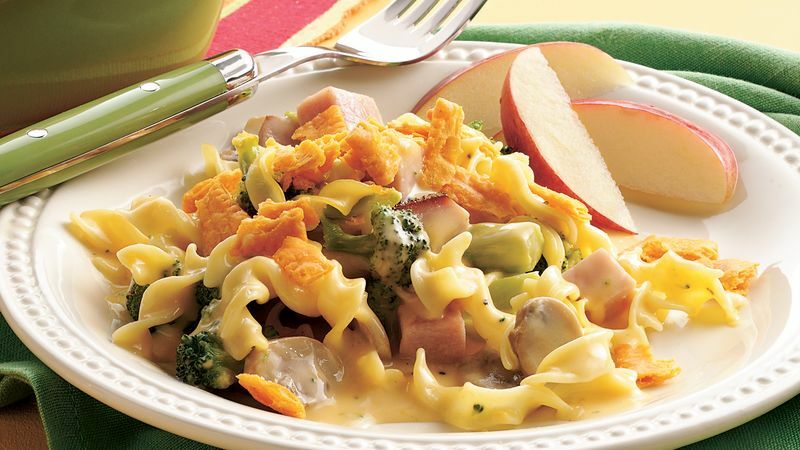 Into cooked noodles in Dutch oven, gently stir broccoli with cheese sauce, ham, cheese, milk, pepper and mushrooms. Spoon into baking dish. Bake uncovered 20 to 30 minutes or until thoroughly heated. Sprinkle crushed crackers over top before serving. Add a special touch to this entrée by adding 1/8 teaspoon of ground nutmeg. This fragrant, sweet spice is often used in divan dishes.